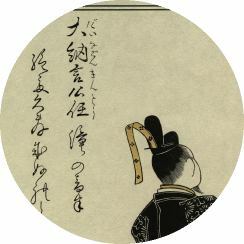 Welcome to the first issue of 'Hyakunin Issho', the newsletter of my 'Hyaku-nin Isshu' Hanga Series. Ever since starting this particular print making project, it has been my intention to produce a little publication like this discussing the work. Over the past nine years that I have been learning about printmaking, I have found that it is a truly fascinating field, and I would like to share with others some of the things that I have discovered. Of course, the actual methods of production of the prints themselves will be a main topic covered, but I also plan to move a bit farther afield and introduce you to some of the 20-odd other people who are involved in the making of the prints that you are collecting. They will include people like the man who gathers the bamboo sheaths used for covering my 'baren' (rubbing pad), the blacksmith who forges my blades, the man who planes the cherry blocks (by hand - far smoother than any electric planer), the baren maker, and of course the family who makes my paper. We will also visit fishermen, stone-cutters, tree-bark peelers, and gelatin mixers. I also plan to step about 215 years back in time, to investigate some of the circumstances surrounding the creation of Shunsho's original book, 'Nishiki Hyaku-nin Isshu Azuma Ori'. Now that I've actually started to think about all this, I realize that getting this story down on paper is going to be as long and involved as the actual work of making the 100 prints! I'm very confident of my ability to make the prints, but less so of my ability to organize and produce the story behind them, but I'll give it a try. Please bear with me if my prose is sometimes lacking in elegance, or if I lose the thread of what I am trying to explain. I feel more comfortable working with my carving tools than with this word processor. In any case, here we go! I suppose that I should start by answering this question, as it is the one asked by almost everybody I meet. Luckily, it is easy for me to answer, because just as this project was getting under way a couple of years ago, I also started to keep a journal, as a way to help keep track of things. Don't panic, I'm not going to ask you to read my diary - but having it handy for reference certainly helps me organize my thoughts. The seeds of this project were sown in early January of 1988, when my wife Michiyo took our two little girls on a week-long trip to visit their grand-parents in Mie Prefecture. Some friends of ours here in Hamura, the Sakazakis, took pity on the 'shogatsu batchelor' and asked me over for dinner one evening. (Actually, I was rather enjoying the peace and quiet, but who could refuse an offer of a dinner ....). During the evening they brought out a set of hyaku-nin 'karuta', and introduced me to the game. I had heard of it before, and had seen sets of cards, but had never had a chance to try playing. I had a good time, and wasn't embarrassed at being beaten by Takayoshi and Kumiko, nor was embarrassed (very much) at being beaten by Ayane-chan, their grade one daughter, but I'd rather not talk about how I did against Yuki-chan, then still a preschooler. I am learning that people from many different walks of life seem to be interested in my work, and in each issue of this little newsletter, I'll feature one of them. 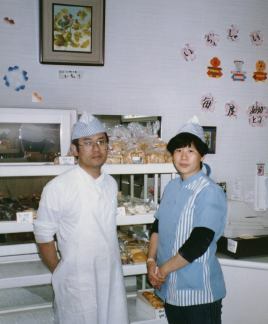 There's no question in my mind as to who to choose to start off - it has to be our first customers, Mr. and Mrs. Cho, owners and operators of the Kotobukiya Bakery here in Hamura. Although we had been shopping at their establishment for a couple of years, they had no idea I was a printmaker until they read an article on my new Hyakunin Isshu series in a local edition of the Yomiuri newspaper, in June '89. They called us up and asked to become subscribers, sight unseen. Since coming to Japan, I seem to have caught an overdose of 'genki', and regularly put in 12-16 hours a day at my three jobs: printmaking, English teaching, and re-writing, but I feel downright lazy when I compare myself to this couple. The lights seem to be on 24 hours a day over in their bakery, and no matter what time I drop by, from early morning to late evening, they are always there, preparing food for my family. Mr. Cho tells me that although he believes that bread is 'a gift of the gods', he feels that the work involved is something of 'a present from the devil'. The Cho family has made their bakery into something of a mini-gallery, with not only my prints on rotating display, but paintings and calligraphy by local artists also hung there. I guess that they have so little free time of their own, the only way they can enjoy these works is to hang them in the workplace! I would like to thank them very much for their support of my work, and wish that it was possible to spend time with them other than across the counter in their bakery. P.S. If you are visiting Hamura sometime, drop by their place and try the 'graham loaf'. My two girls are growing up on it! One bright spring day this year, my wife and I took some time out from our own work to visit the man who supplies me with the cherry blocks necessary for my printmaking, Mr. Shintaro Shimano. He is a very busy person, but graciously allowed me to steal some of his time to ask a few questions and watch him working. Stepping into his workshop is like stepping into another world. Curly shavings and off-cuts of cherry wood reach waist high in mounds around the small room. A couple of months ago, in the coldest part of the year, the room would have been filled with the fragrance of burning cherry, for what other heating fuel would possibly be needed by someone who spends his days creating these mountains of wood chips? The old cast iron stove is cold now, and the door is thrown open to the spring air. 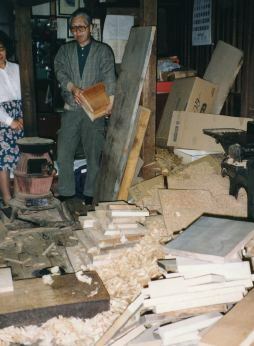 Only a tiny space in the center of the room is clear of debris, and here lies his 'atedai', the massive slab of thick cherry upon which are placed the blocks to be planed smooth. He sits cross legged on a thin cushion before this altar, and with repeated passes of his finely honed planes, gradually peels away the unwanted roughness, to leave a finished surface smoother than one could possibly imagine. No electric planer yet made can do such an accurate job on this obstinate wood, nor can any sandpaper leave the required 'hard' surface. 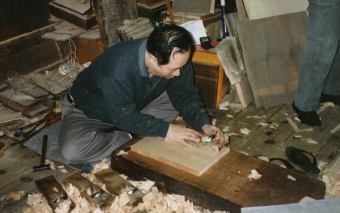 As he progresses through the sequence of five different planes used on each board, the shavings become gradually thinner and thinner. I pick up some of these to inspect them, and find that they are almost transparent in their thinness. I can actually read a newspaper through one. Mr. Shimano, now 53 years of age, is one of only two men in the world still doing this job. As the only other worker is an older man in his 80's, it seems that Mr. Shimano will at some point in the future become the last of the breed. 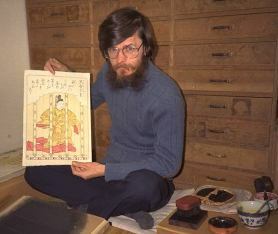 He is indeed a member of an 'endangered species', ukiyo-e printmakers, a group of men stranded in a time warp, practicing a craft that logic would dictate should have died a century or so ago, when mechanical printing arrived in Japan. Why does he still do it? Shimano-san came to this work by following in his father's foot-steps. He is the third generation of his family to work these planes, in this room, and presumes that he will be the last. For him, there is no question of stopping. It is his job, and he takes pride in doing it as well as he can. There is also the question of responsibility to the craft. Upwards of 50 or 60 people, carvers, printers and publishers, are totally dependent on his blocks to do their jobs. If he decided to discontinue production, they (and I!) would be thrown out of work, and ukiyo-e would take its final bow, some 300-odd years after its birth. He receives no acclaim for his work, no 'National Living Treasure' designation. Day after day he labours on, endlessly stroking these hard blocks with his planes, in his tiny shop planted firmly right in the very area where ukiyo-e once thrived (Hokusai's grave is just around the corner, and Shunsho's is a short walk away). His friend and neighbour, Ishii-san the carver, drops by for a chat. A print publisher calls to discuss an order of blocks. On the street he meets his old school mate Kaneko-san, the bamboo skin supplier. They all wish him good health, and so do I, and so should you. Without his dedication, we lose everything. Shimano-san, thank you very much. One of the most common questions I am asked about this work concerns the similarity between my prints and the originals. Are my prints exactly the same? How do I actually do that? I don't own a copy of the original book. Copies of the first edition (the one I am repro-ducing) are extremely rare. I have only found references to two copies, one in the British Museum in London, and one here in Tokyo at the Toyo Bunko. 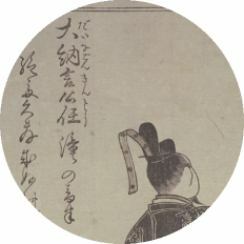 Copies of later editions of the book (which have the same illustrations, but which are printed without Shunsho's beautiful calligraphy) are more common, and are sometimes available in rare bookstores in Tokyo or London. With the cooperation of the Toyo Bunko, I have purchased a photographic negative of each page of their copy of the book. From each of these negatives, I have a photo enlargement made for me by a professional photo lab in Tokyo. I order this enlargement the same size as I want the finished print - 366 millimeters top to bottom. This is 1.68 times the size of the prints in the original book. The next step involves making a copy of this photograph on very thin paper, suitable for transferring to the woodblock. I use a sheet of very thin, delicate washi, which I paste onto a sheet of standard copy paper, using a light spray glue. This combination is loaded into the tray of a good quality photocopy machine, and I then make a photocopy of the large photograph, using the highest quality copy machine I can find. After some careful re-touching of any necessary details, I then paste the two-paper combination face down on the surface of the woodblock, and peel the copy paper carefully from the back of the washi (which now carries the image). This process thus gives me an exact copy of the Edo-era print outlined in reverse on my wood, ready for carving. In case you are wondering how the Edo-era carvers did this without the benefit of photocopy machines, remember that they were not trying to make copies of anything. Shunsho drew his original drawing on a very thin strong washi, and it was this 'original art work' that was pasted onto the block. It was very thin paper indeed, and only the most expert carvers were allowed to past it down. If they botched the job (as I have done a few times), the artist would have to create his design again from scratch. Well, that's it for this time. I'm not quite sure just when I'll be getting the next issue out, but hope that it won't be too far off. I eagerly await your comments, criticism and contributions, as it is only through your feedback that I am able to gauge how my work is being received. If you have anything to ask about the printmaking work itself, or the project as a whole, please do not hesitate to contact me. Do not worry about 'bothering me' during the work. The carving and printing are both very 'solitary' affairs, and distractions are usually welcome. Those of you who live nearby are welcome to drop by our apartment anytime to see the work in progress, while those of you living away from Tokyo can call us and make arrangements to stop by next time you are visiting the 'big city'. Come on over!